Media Size Choose an option18" x 24"26" x 34"
People gasp as this gutsy biker shows her daring side as she playfully balances on the rails in Niagara Falls, much like the thrill seekers who felt the tension as daredevil Nik Wallenda made his historic death-defying walk across the treacherous falls. What Wallenda did was amazing, but Jay Cochrane will be at the show, and performing 88 tightrope walks in Niagara Falls all summer long! Jay Cochrane will also be signing the collectable print at our gallery at the show. She teeters on the edge risking life and limb, yet seems unaware of the danger that one missed step could bring. Her balancing act has shades of legendary “Indian Larry”. As a professional stunt driver/bike builder, he was most famous for standing on his motorcycle at break-neck speeds. If you’re an adventurer then this latest piece by “Motor Marc” will appeal to your dangerous side. 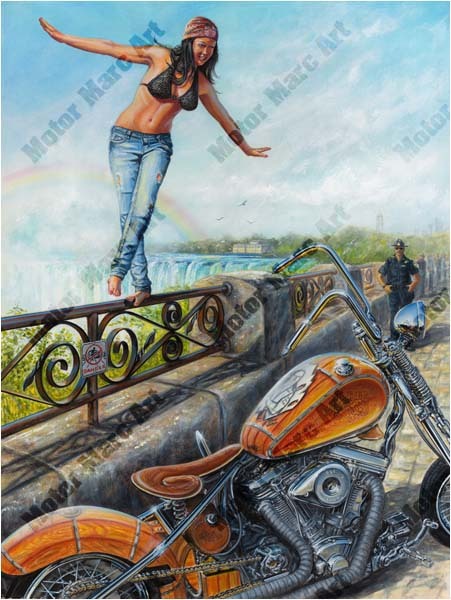 This work was featured art for the Niagara Motorcycle Show. 18" x 24", 26" x 34"